The Star Wars franchise made a huge comeback last year with ‘The Force Awakens’. With Disney at its helm, the new installment succeeded in satisfying the fans and became their new hope (Yup, I did it). Rogue One: A Star Wars Story, the first of Disney’s three planned Star Wars spin-off has released finally and I have to say that Disney knows what it’s doing with the franchise. Rogue One is a fantastic new chapter in the Star Wars saga and adds a lot to its expanding mythos. This review contains no Rogue One spoilers. Rogue One: A Star Wars Story is actually a prequel to the first Star Wars movie. Rogue One tells the whole story about the opening crawl of the first film. It shows us how the Rebel Alliance got to know about the existence of Empire’s greatest weapon, the Death Star, and their ensuing attempt to retrieve its structural plans which helped them to destroy it. We finally get to know the very interesting tale of the Rogue One fleet which helped the Rebel Alliance to destroy the Empire’s plan. Like it was already announced, Rogue One didn’t start with an opening crawl but instead, it begins with a prologue about the lead character, Jyn Erso’s conflict with the empire and how it changed her life completely. 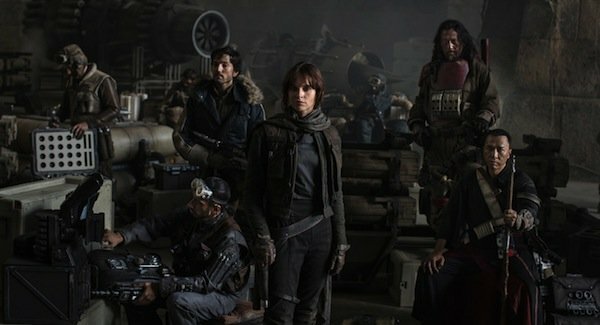 While Jyn can be called the protagonist, all characters get proper character development and make it an ensemble cast. Rogue One uses brilliant characters to tell a story we already know with so much depth (and awesome fanservice) that every fan out there will fall in love with it. Characters which need a special mention are K2-SO and Cherrut Imwe. From C-3PO & R2-D2 to BB-8, Star Wars has proved that their droid game is really strong and it continues to do so with the awesome K2-SO. He steals every scene he’s in with his blunt and sarcastic remarks. Donny Yen’s character Cherrut Imwe is perfect in every sense with his charismatic persona and brilliant action sequences. If we are talking about characters then how can I miss mentioning Darth Vader! Darth Vader’s appearance makes it worth the ticket price alone. I would even go on to say that Darth Vader’s Rogue One appearance is the greatest Vader moment of all time and how can it not be when James Earl Jones is voicing him. Other than Vader there are many more cool character appearances and easter eggs which fans should look out for. Being a fan of the franchise I don’t really have any problem with this movie. Everything was perfect if we consider what the movie was trying to be. It was a proper Star Wars spin-off and what some of the Rogue One bad reviews said about it was unnecessary. It wasn’t an episode like others and it neither tried to be one. Having no opening crawl or ignoring some big elements of the Star Wars franchise like the force doesn’t weaken it. Although I can say that if this story wasn’t being told in the Star Wars universe then it would have been a pretty simple heist story but what else could the writers have done? They had to make this movie in such a way that it perfectly ties into the original story while not disrupting any of the established mythos. Rogue One: A Star Wars story, directed by Gareth Edwards is a brilliant addition to the franchise which not only stands tall on its own but also adds a lot more depth to the original movie and connects to it in a delightful and direct manner. I’ve such high hopes from Star Wars Episode VIII now. Rogue One: A Star Wars Story is a fantastic new chapter in the Star Wars Saga and will satisfy every fan.